I was thinking about Valentine’s Day since the last week of January & wanted to start preparations early… I had a whole lot of recipes bookmarked but somehow things did not work out the way I had planned. I wanted to post since the beginning of February but I realize planning is just not meant for me! Pre-heat the oven at 170 C.
Prepare the cake batter as per the recipe. Add color depending on how rich you want it to be. Fill the cup cake moulds to about ¾ capacity or about a tablespoon or depending on the depth of your moulds. Bake in a pre-heated oven till the cup cakes are done. Do the toothpick test to check if the cakes are done. Cool the cup cakes completely. Meanwhile, heat enough jam with a few tablespoons of water. Do not add too much water. Cool the jam. The jam should be sufficiently thick to coat the cakes. Spread enough dessicated coconut on a tray or in a bowl. 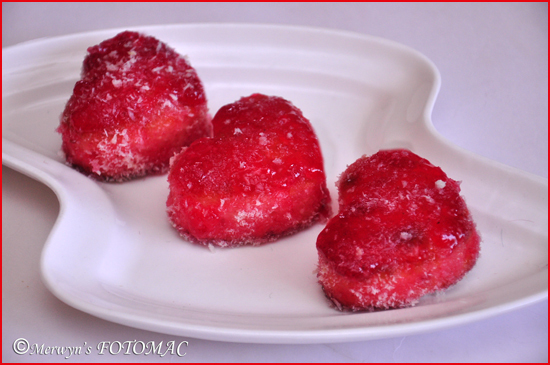 Dip each cooled cup cake in the jam so that it is evenly coated on all sides. Then roll in the dessicated coconut so that it coats completely. Serve with love & enjoy! !